Posted June 19, 2012 by grohling & filed under BCS Oxfordshire, General Interest, Student Awards. Nigel Crook, Head of Department, Department of Computing and Communication Technologies, and Mrs Frampton. 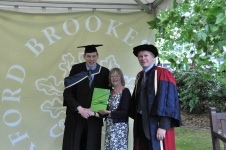 Each year the British Computer Society recognises the efforts of students at Oxford Brookes through the presentation of prizes in the area of computing. The 2012 winners are Paul Oliver and Ian Peter Frampton. "It was a great surprise to hear that I had won this award. I feel honoured and proud to have received it. I am determined to achieve the best results I can on my degree course in Mobile Computing and this award gives me even greater motivation to succeed. 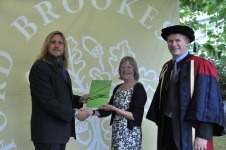 I am enjoying my studies at Oxford Brookes where there is a great mix of young and mature students." "To be recognised by such an established institution as the BCS is an honour of the highest accord. I was able to use everything I had learnt in my previous 3 years both at Brookes and also whilst on placement to produce this project and for me this is the culmination of 3 years of effort to produce the final outcome. I owe a great amount of gratitude to both the staff (both teaching staff and support staff) and also the BCS in recognising my work and also the effort put in to produce it. This is an accolade which I will talk proudly of for many years to come and it has made the late evenings and early mornings very much worthwhile. I am now starting the next stage in my career as a Graduate Developer for Golfbreaks.com and I am very much looking forward to making the next steps in my career. Oxford Brookes have provided me with an ideal toolkit filled with skills and ideas, which is testament to the fantastic staff and services which have proven invaluable to me. Thank-you again for the gift and award and I will talk proudly about my achievements for many years to come."